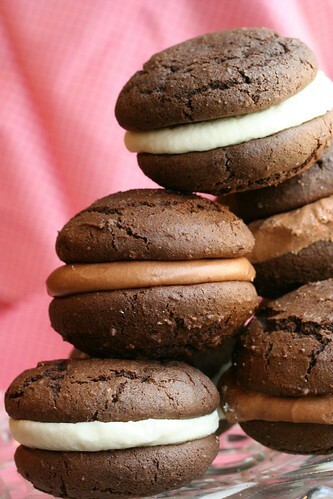 What better day of the week than Tuesday, for some amazing Whoopie goodness! Which ever kind you'd like really. I made these the other day and I think I personally ate them all, but one. Mix sugar and butter until fluffy. Add eggs and mix until combined. Alternate additions of dry ingredients and wet ingredients, until everything is in the mixing bowl. Mix briefly, until all ingredients are evenly and thoroughly combined. Make sure dough is fairly firm - it should not be wet or gooey at all. It should look like this. If it doesn't add a little more flour. Bake for about 10-15 minutes or until a toothpick comes out dry or the top of the cookie does not retain a mark when touched with your finger. I prefer the pies a little more fudgy and less dry, so if you want a slightly more fudgy cake, pull it out of the oven before the top feels hard. Allow to cool completely before icing. When ready to ice, use a pastry bag fitted with a star tip or a round tip to create a pretty pattern or just spread a dollop of icing on the cookie with an offset spatula or anything handy you happen to have around your kitchen. 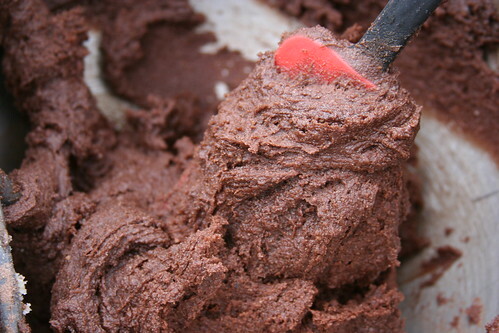 When you are done, if you wrap the whoopie pie in plastic, it will start softening up. 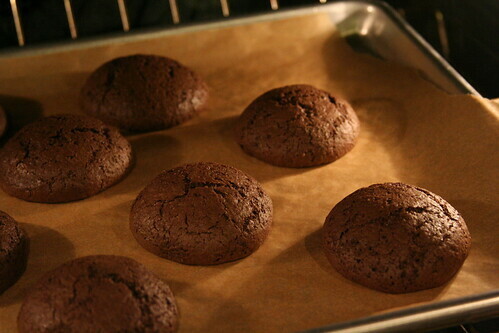 In my opinion, Whoopie Pies taste best when they are softer after they've sat in plastic for a day. Yield: enough to ice your Whoopie Pies and your cupcakes, if you have them. So halve the recipe if you don't have an overwhelming need for a surplus of icing. Combine butter and 4 cups of the confectioners sugar and mix until it resembles corn meal. If it combines completely, that's okay. Add the buttermilk with the salt and the vanilla. Mix until completely incorporated. Add 2 more cups of confectioners sugar. Mix again. If the mixture is still wet, add another cup or two of sugar. When it is spreadable but holds its shape, it is done. As my mum says: "Holy macaroni!" Wow, those look so delicious, I can probably stare at them all day long! i will wait a few more weeks. Carol, You would EAT them... not stare. Trust me! Sis, we shall eat some very soon! Yes, indeed!! !